In six seasons with the Cavaliers, Irving’s defensive rating (number of points per 100 possessions with him on the floor) was 109. This season, his defensive rating is 97. 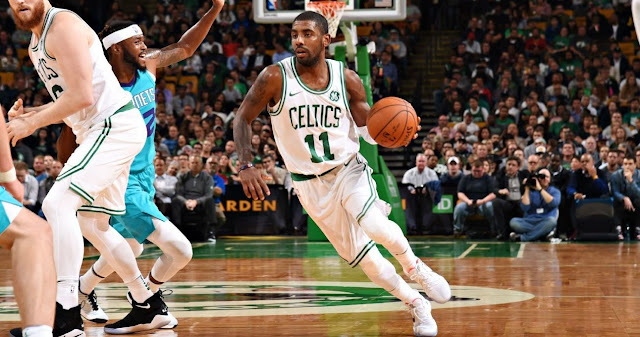 And Irving, who has never averaged more than 1.5 steals in any season, is third in the NBA with 2.43, a testament to guessing right more often and his increased effort and improved positioning. His offensive game with the Celtics is virtually identical to what he did with the Cleveland Cavaliers. The minutes, points, rebounds and assists are very close. But the defensive stats are up, both defensive rating and steals per game. He really wanted to be The Man in Boston, and that would not have happened if his defense lagged. There is nothing more important in a close playoff game than a cold-blooded finisher. Kyrie is that. He can finish at the rim or from distance. Rivals have always feared his ball handling and ability to score in so many ways. Now, as a Celtic, he is a defensive nuisance. In other words, a complete player. When Kyrie came here, the question was raised whether or not he was a franchise player. It is way too early, but the answer seems to be that he is. And when you surround an extremely talented franchise player with very talented, up-and-coming team mates, the future looks very bright. And speaking of the future, Gordon Hayward hurts nothing and adds everything. This season, we are heavily into the playoff mix. Next season, with Gordon back, I frankly can't see any team equaling the Celtics lineup. One other point. Irving is not yet in the top running for MVP. With Al Horford playing like a absolute superstar, and Jayson Tatum looking like a soon-to-be perennial All-Star, MVP for Kyrie will be a reach. But the fact he has become a complete player, coupled with a great end-of-season record, will work in his favor. I envision him getting into the top five in the MVP voting at the very least. Horford - Defensive Player of the Year? Jaylen Brown - MIP? Jayson Tatum - ROY? Kyrie Irving - MVP? Anything is possible!